Every Friday we try to post a song from the Shabbat liturgy to greet the weekly day of rest. These songs generally include Shalom Aleichem, Lecha Dodi, and Adon Olam. Today's Shabbat song is V'Shamru, part of the Friday night and Shabbat morning services. It is taken from Exodus 31:16-17. Shabbat is created to give us rest and to restore the soul. “Vayinafash” is from the Hebrew word “nefesh” (soul). Shabbat is the promise that there will be a time of peace for all people. As God guards us, we guard Shabbat. וְשָׁמְרוּ בְנֵי יִשְׂרָאֵל אֶת הַשַּׁבָּת, לַעֲשׂוֹת אֶת הַשַּׁבָּת לְדֹרֹתָם בְּרִית עוֹלָם. בֵּינִי וּבֵן בְּנֵי יִשׂרָאֵל אוֹת הִיא לְעֹלָם. כִּי שֵֽׁשֶׁת יָמִים עָשָׂה יהוה אֶת הַשָּׁמַיִם וְאֶת הָאֳרֶץ, וּבַיּוֹם הַשְּׁבִיעִי שָׁבַת וַיִּנָּפַשׁ. The children of Israel shall observe the Sabbath, observing the Sabbath throughout their generations as a covenant for all time. It is a sign forever between Me and people of Israel. For in six days the Eternal One made heaven and earth, and on the seventh day God ceased from work and rested. 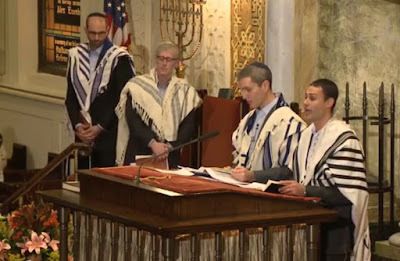 In this video, Azi Schwartz, cantor of the Conservative Park Avenue Synagogue in New York, leads the congregation in singing V'Shamru.